Most common quilting errors involve one aspect of construction -- accuracy. But quiltmaking accuracy isn't about a single skill or technique, it's dependent on how the entire set of skills used during construction flow together to create a project that's just right at its completion. Take some time to learn how to make the necessary skills mesh together, and your quilts will turn out exactly as planned. Let's take a look at five common quilting errors that can easily be avoided. To prewash fabrics (or not) is high on the list of items that quilters have different opinions about. I prewash everything when it comes in the door, but many quilters leave fabrics as-is, just as they come off the bolt. I don't worry too much about fabric bleeding and crocking these days, but am still a bit concerned about shrinkage. You'll find that quality quilting cottons don't shrink a bunch, but when you mix unwashed fabrics with prewashed fabrics a slight amount of shrinkage could distort patches the first time a quilt is laundered. Why take the chance? There is one exception to my personal prewashing 'rule.' If I want to make a quilt with the slightly puckered appearance of a vintage piece, I use unwashed fabrics and all-cotton batting. During the quilt's first wash, fabric and batting shrink a bit and the puckering appears. There are exceptions, such as paper piecing techniques, string quilting and a few quick piecing methods, but most seam allowances used in quilting are 1/4-inch wide. It's important to set up your sewing machine to sew a correct seam, but at the same time recognize that inaccurate cutting can result in components that are the wrong finished size, even if seams are perfectly fine. Think of the two as a tag team -- cut correctly sized pieces and sew them together with a seam of the correct width. Sometimes the best seam is a 'scant' quarter inch -- just a teeny bit shy of the actual 'textbook' width. Why? Maybe because pieces were cut slightly smaller than they should have been cut, but also because of the tiny width of fabric that's lost when seams are pressed to the side, over the thread. Practice cutting and be sure to prep your machine. Test the results to figure out exactly where to position matched pieces as they flow under the presser foot. Ah, pressing -- it can either improve your patchwork or stretch it into an unrecognizable shape. In many cases, you'll set the iron down flat on a piece of patchwork and let the heat and weight do the job, with no movement of the iron at all. But it's also necessary to work the tip or edge of an iron (gently) into a seam allowance. Firm pressure and minimal (or at least slow and controlled) movement are key. It may help to remember one simple phrase: press, don't iron. Yes, you'll have to move the iron around sometimes, especially when pressing yardages, but do it with care to prevent the fabric's grain from getting wibbly-wobbly. I don't use steam, preferring instead to spritz a bit of sizing or other pressing aid onto specific areas that need a bit more TLC. The sizing helps stiffen my prewashed fabrics, making them easier to cut. Other quilters do use steam, and with great success. Try both methods to discover which works best for you in different situations. Quiltmaking is not a race. Have you ever had problems with seams that seem to become more narrow as you reach their endpoints? Slowing down will help correct that issue. Many sewing machines have variable speed settings that make it easy to work at slower speeds, and trust me, slowing down does improve accuracy. Slower speeds give you time to keep the presser foot secure against the patchwork, and that helps keep seam allowance at just the right width. Take it slow until you're comfortable with your work, and then try upping the speed. After more years than I'll mention, I still sew with my speed dial turned down. New quilters sometimes become so frustrated with a first pattern that they stop working on the project and decide to never make another quilt. Choose a pattern that's fairly simple for your first outing. When it's complete, you'll feel good about the process and ready to tackle a quilt that's just a bit more involved. Remember that 'easy' does not have to mean 'boring.' Some of today's contemporary quilt patterns are super simple -- and gorgeous. What to look for in a first quilt. 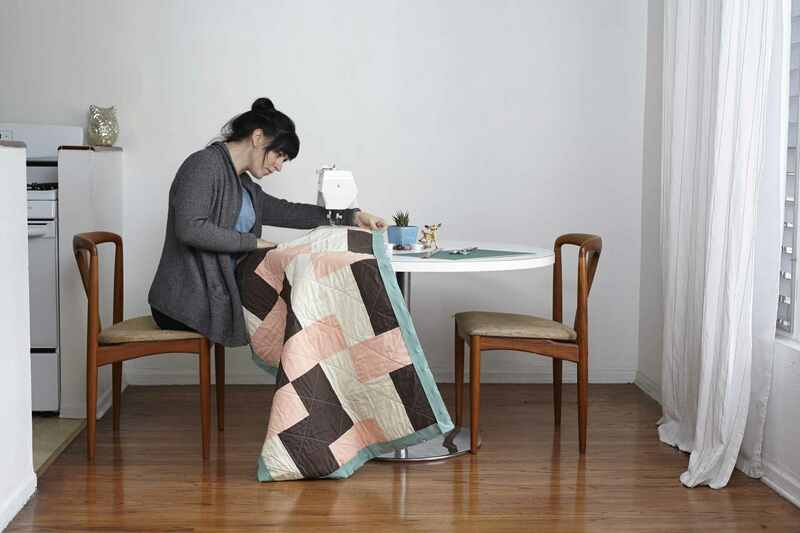 Try a quilt that's made up of straight-edged pieces -- no triangles (even though many triangular units are quick pieced). It's an old saying, but 'practice makes perfect' applies so very much to quilting, and I encourage all new quilters to scour the bargain-bins at local fabric stores in search of inexpensive cuts for test purposes. Do try to test with 100 percent cottons, since they'll provide the same basic 'feel' you experience when working with more expensive quilting fabrics. Don't stress if blocks or pieces within blocks are not absolutely perfect. Those little bobbles aren't errors... they're areas with unique character.